Defence Research & Development Organisation (DRDO) will take Centre For Personnel Talent Management (CEPTAM)-08 Tier 2 exam. Through this test, 1142 posts of Senior Technical Assistant (STA), Stenographer, Junior Translator, Admin Assistant, Store Assistant and Technician will be filled. 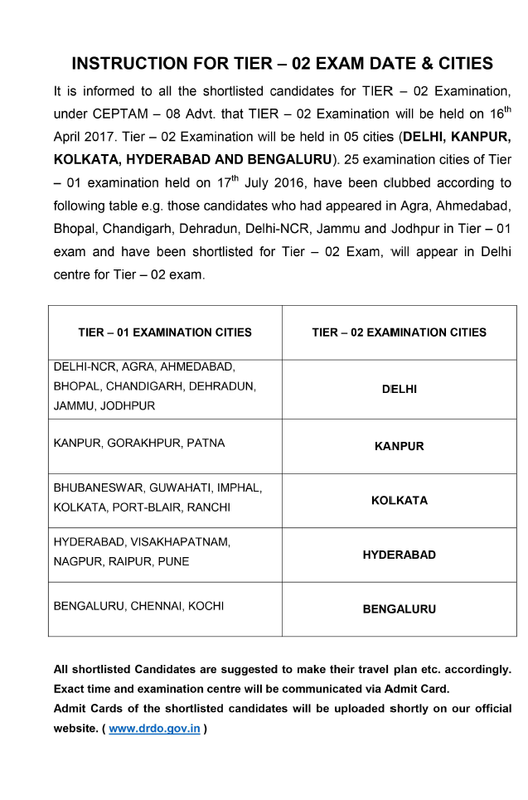 Latest update : DRDO CEPTAM 8 Tier 2 exam will be held on 16.04.2017. Admit cards can be downloaded now till the exam date. UPResultsAdmitJobs.in had updated you on this. The DRDO Entry Test is going to be held on 16 April 2017. To appear in this test, candidate need to download their CEPTAM 8 Admit Card 2016 from the official website of DRDO. The examination of all post codes will be completed in two shifts on a single day. The written examination for the posts of STA ‘B’ & Technician ‘A’ will be conducted in different shifts on the same day all over the country. The examination for the posts of Admin Assistant ‘A’ and Store Assistant ‘A’ will also be held in separate shifts but it willl be time-clubbed either with shift for STA ‘B’ or Technician ‘A’. 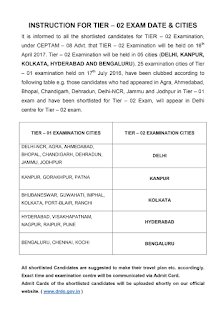 The test will be held at following centres. Candidates can download them by entering their Registration Number and date of birth. Candidates are required to bring one photo identity proof along with CEPTAM admit card. Candidates shortlisted based on written examination merit are called for document verification, trade/skill test and *interview based on their ranking in written examination. You can download CEPTAM 8 Admit card from below given link. The minimum qualifying marks in written examination are 40% for UR/OBC Candidate and 35% for SC/ST candidate. It will be mandatory to qualify each section of question paper separately.